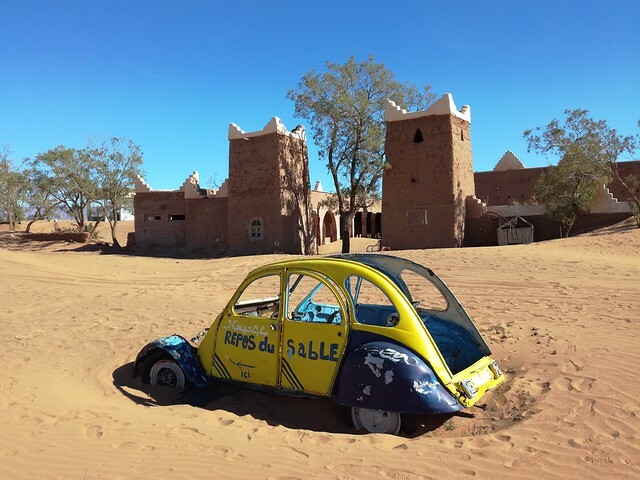 Not far South of Tamegroute, the road passes by a hotel that has seen better days – a skeleton of a 2CV is indeed reposing in the sand – it may never get back out of there! The hotel itself is a bit lost to the sand; there are little dunes in the courtyard, the swimming pool is full of it and bigger dunes outside snuggle up to the perimeter walls. It looks deserted, but we hear voices. 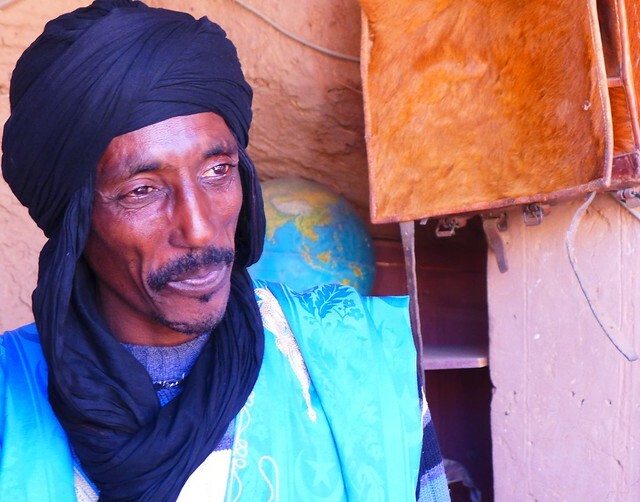 We walk in and find Mohamed, a Touareq, who seems to be squatting there, having installed a little solar panel. Mind you, he still offers bedrooms and they have hopeful names like ‘marriage’ and ‘cinnamon’ and ‘rose’, but they are long past their heydays, with the doors falling off their hinges. It’s kind of quirky though to be in a squatted hotel – I can even imagine that some people actually come and stay here! Mohamed is a bit evasive about his role here. He tells us that the hotel has been empty for a number of years, following the death of the owner’s wife. He shows us the various rooms and courtyards. Abandoned items lie around; old pots and tagines, decorative items, knicknacks. If you like anything, take it he says, vaguely gesturing across the compound. I’m confused – is he the guardian, does he get paid to look after the place? Not exactly, he says, but won’t be drawn any further on the matter. A friend of his sits on the terrace, dangling one leg over the side of the wall, playing a one-string guitar. I wish I had some guitar strings on me to give to him, but this year I’ve got my bandoneon with me, not the guitar. Maybe a guitar would have been wiser – my Bandoneon does not like Morocco. By now, two buttons have come loose, the tuning has suffered considerably and the bellows are wheezing a little. The roads are too bumpy and the climate too dry, I guess. We have quite a lot of food in the van and our Touareq looks pretty thin, so we invite him for lunch. We set out a table by the side of Emma in the sunshine and share a chicken dish with some greens and a carrot and beetroot salad. He says it’s the most he has eaten in a long time. 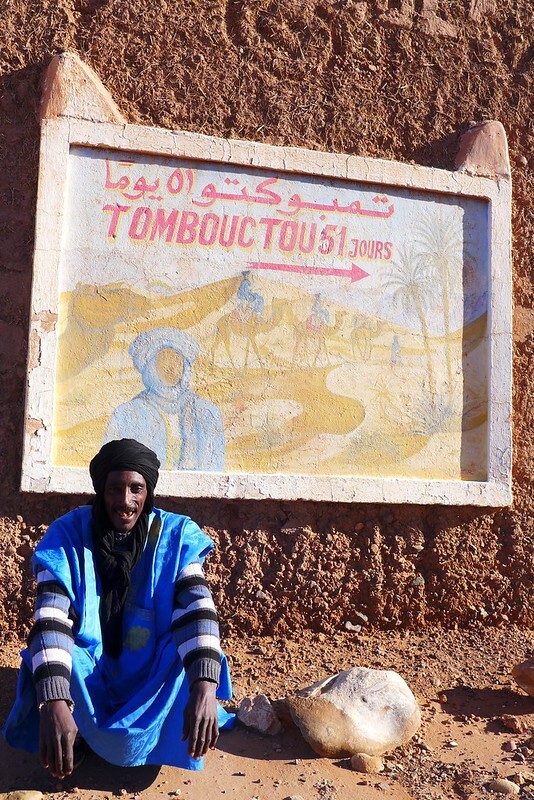 After lunch, we ask Mohamed if we can take a photo of him against the hand-painted sign directing people to Timbuktu. He shows us his ID card with his address on, so we can send him the photos when we get a chance to print them. It often happens that people show us their ID cards. It’s one way of giving their address. Sometimes, people are quite open about not being able to write, other times, they will hide it, saying something like they have a pain in their arm and currently can’t write. Although the desert itself is magnificently silent, the Hotel Repos du Sable is right on the road from Zagora to M’hamid (another famous desert spot), where many vehicles thunder past. We don’t want to stay here for the night, so we head back towards Tamegroute. Suddenly we realise that we’d been in such a rush to leave the touristic atmospheres of Zagora and Tamegroute that we still haven’t refuelled! We notice that our tank is pretty much empty, so we can’t afford to do any extra mileage to find a nice sleeping spot. We pull up outside the library in Tamegroute, ready to defend our space against hawkers. Strangely enough, although there are lots of people about, no-one bothers us. It seems they are 9-5 hasslers! I take my bandoneon out and practice in the balmy evening air. Frank lights a fire in Emma. The wood we picked up two days ago is indeed smokey – soon a cloud of it is hanging over the car park and drifting towards the village… No one complains though and we have a very lovely night there with no disruption at all!